BRAND NEW from TheScrabble Gal! 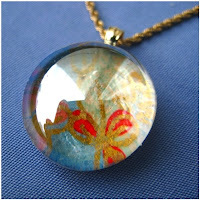 Learn how to make beautiful glass tile pendants and home accessories yourself! 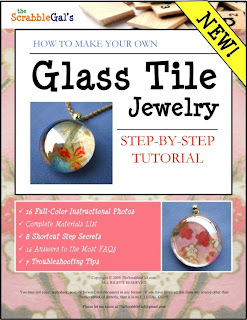 My full-color, step-by-step tutorial “How To Make A Glass Tile Pendant” teaches you everything you need to know to make your very own gorgeous jewelry and home accessories using glass tiles or marbles and decorative papers. - My personal email address - just in case you run into any questions along the way, or simply want to share photos of your finished product! And as a bonus, I’ll even divulge my personal list of sources so you know exactly where to find everything. "WOW WOW WOW... I love it Fab ideas & super quickly sent to me here in the UK. Thanks so much!!!! xxxxxxxxxxxxxxx"
"GREAT, IN A MATTER OF MINUTES I HAD MY TUTORIAL....SUPER .....I LOVE THE SCRABBLE GAL"
You will receive my Glass Tile Jewelry Tutorial instantly. Simply click on the "Get Started Now!" button below.